I recently federated an on-premise OCS 2007 R2 deployment with a Lync Online domain, and wanted to highlight something that is not well documented. The procedure is largely the same on from the on-premise OCS Edge has it is for adding any other Federated partner – you add the Federated partners SIP domain has an Allow federated partner on the OCS Edge Access server. What is not well documented, is that when you add the Lync Online SIP domain to the OCS Edge, you need to specify the option Access Edge server associated with this domain to be sipfed.online.lync.com. This is because the DNS SRV record associated with your *.onmicrosoft.com domain currently resolves to sipdir.online.lync.com but the access edge that is capable of handing it is sipfed.online.lync.com. In addition to this, a currently limitation to be aware of, is that Lync Coexistence is not supported right now in the Office 365 Beta. This means that Lync does not support cloud/server co-existence between Lync Online and on-premise using a single domain. In otherwords, the Federated domain cannot match your Lync or OCS on-premise domain. This will be supported in the future; I have not heard a date of when – I am guessing when Office 365 is made Generally Available. I recently federated an on-premise OCS 2007 R2 deployment with a Lync Online domain in the Office 365 Beta, and wanted to highlight something that is not well documented. The procedure for federating is largely the same from the on-premise OCS side as it is for adding any other Federated partner – you add the Federated partners SIP domain has an allowed federated partner on the OCS Edge Access server. 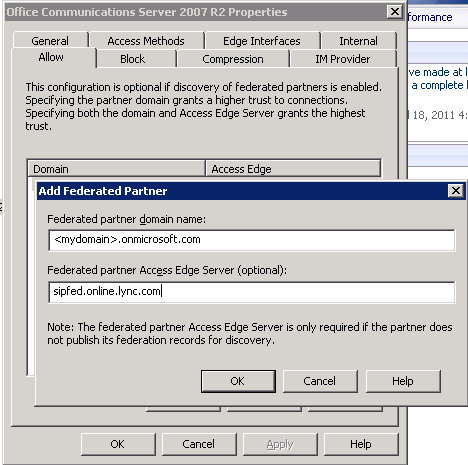 What is not well documented, is that when you add the Lync Online SIP domain to the OCS Edge, you currently (May 2011) need to specify the optional partner Access Edge server that is associated with this domain to be sipfed.online.lync.com. This is because the DNS SRV record associated with your *.onmicrosoft.com domain currently resolves to sipdir.online.lync.com but the Lync Online Access Edge that is capable of handing it is sipfed.online.lync.com. In addition to this, a current limitation to be aware of is that Lync coexistence is not supported right now (May 2011) in the Office 365 Beta. This means that Lync does not support cloud/server co-existence between Lync Online and on-premise using a single domain. 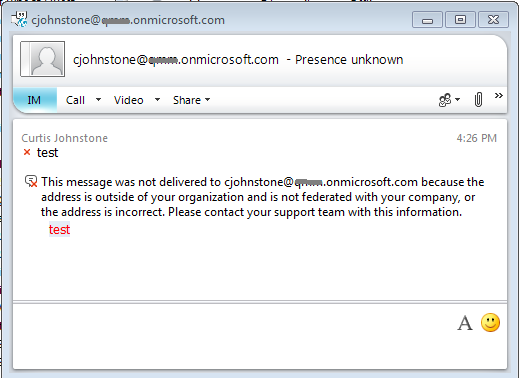 In otherwords, the Federated domain cannot match your Lync or OCS on-premise domain. This will be supported in the future – I have not heard a date of when. Hi, you should add that one domain explicitly as shown in the screenshot. I cannot remember whether you also need the onmicrosoft.com domain also – I don’t think you do. i have added ‘1′ additional domain with my onmicrosoft account and want to federate that domain with OCSR2. Should i add that domain e.g abc.edu in the above screen shot or have to add my abc.onmicrosoft.com domain ?